When he says this it is August 20, 1976 and little does Peggy understand, but it is the last date she will know for nine years. This is Claire Fuller’s debut novel, Our Endless Numbered Days, and Peggy is the narrator whose journey with her father is not one you’ll soon forget. Despite her love for her father, Peggy knows, in the way children often do, that something between her parents is not quite right. Her mother has earned all the money that makes their life possible and allows her father to indulge his increasing interest in surviving the end of the world. His London friends are all of the same mindset as is the one American who hangs around their house and fills his head with tales of a bucolic life in a cabin in the woods, faraway from all that is soon to fall into chaos. In preparation for the end days, her father spends all his time turning their basement into a shelter but when her mother leaves on tour, he decides they need a vacation and they depart for the wondrous cabin. It is only when her father tells her, first that her mother is dead and later that the world has been destroyed, that she knows their time here is forever. That the ‘cabin’ is a falling down shack only cements her belief that the world has ended and that this is all they have left. 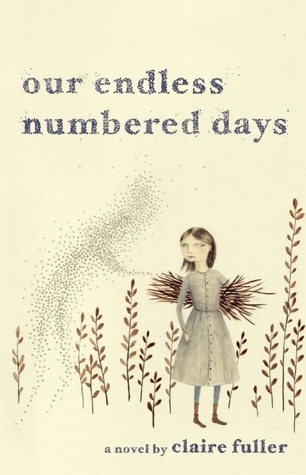 Our Endless Numbered Days does more than cross the span of nine years in a young girl’s life; it travels a panoply of situations and emotions. Peggy is an intelligent girl but through her Fuller shows how a child can be isolated enough to mentally forego what they know to be the truth. It isn’t until years later, when she sees a pair of boots walk by her forest hideout, that Peggy begins to question her father’s story and to contemplate the fact that she does have options. Just as panoply means wide-ranging, it also means “a protective covering” and in many ways this is Fuller’s truth in Our Endless Numbered Days. Peggy’s panoply is so well designed that we can follow her through the years in a remote forest to her re-integration with the outside world and be as emotionally shielded as she is. It is only when Fuller, like a master magician, sweeps the cloak away in the final pages that we see how deftly she has rearranged the objects of Peggy’s life. And like any spellbound audience, we are left shocked and surprised. All of the things around us belonged to a different person, someone whose bedroom I had temporarily taken over until I could return to the forest. I’ve been hearing great things about this one…it’s now on my TBR list. I had friends hyping it big time which can lead to disappointment but not with this one. It’s a genre busting book because it goes so many ways- all of them good. And an ending that will make you gasp. It’s beautifully written and a stunner of a plot- you’ll enjoy. With every review I want to read this book more! Reminds me of North of Normal, a memoir from last summer. Very similar to this. Goodness, this book sounds amazing! Adding it to the TBR pile. You last paragraph absolutely nails what is so fantastic about this book. I still can’t stop thinking about the ending! Yep, I can hardly wait to get my hands on this book. Everyone is raving about this book, and I am so curious to find out what exactly happens… And I love the cover. I can’t wait to get to this one. I am so behind on my ARCs! Great review! I absolutely loved this book and wish Fuller had a backlist to read.